Prime Minister Narendra Modi is visiting Mumbai today for the inauguration of the 'Shivaji Smarak'. Prime Minister Narendra Modi will be on a day's visit to Maharashtra today for the foundation ceremony, where he will lay foundation stone for the grand memorial of Maratha warrior king Chhatrapati Shivaji Maharaj and the metro rail projects in Mumbai and Pune. Special Police teams are assigned and security arrangements have been intensified throughout the city for the inauguration. Authorities have said there will be no traffic diversions on Saturday. Modi will land in Mumbai at 11.30 am and leave for MIDC Patalganga in neighbouring Raigad district where he will inaugurate the newly-built campus of the National Institute of Securities Management - SEBI. The Prime Minister will then reach Raj Bhavan and later move towards Girgaum Chowpatty for the Shivaji Memorial event. 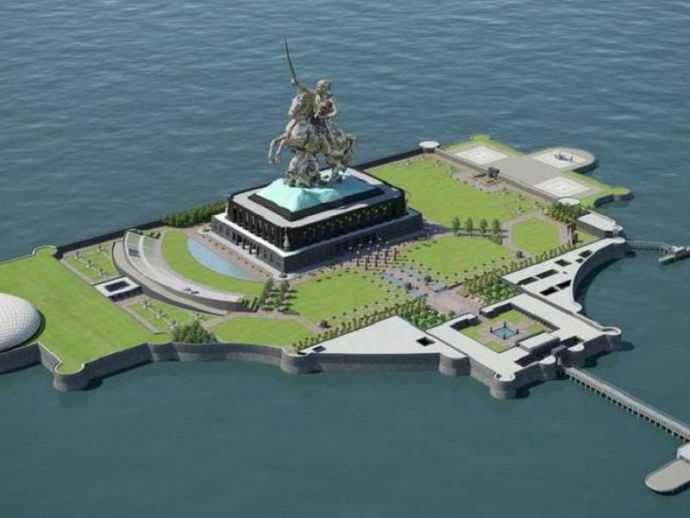 There will be a 192-metre-tall statue of the iconic Maratha King, built entirely in the sea on an islet of 15.96 hectare. The site is a rocky outcrop, roughly 1.5 km from the Raj Bhavan shore. The construction cost of this Shivaji Memorial is estimated to be 3600 crore. 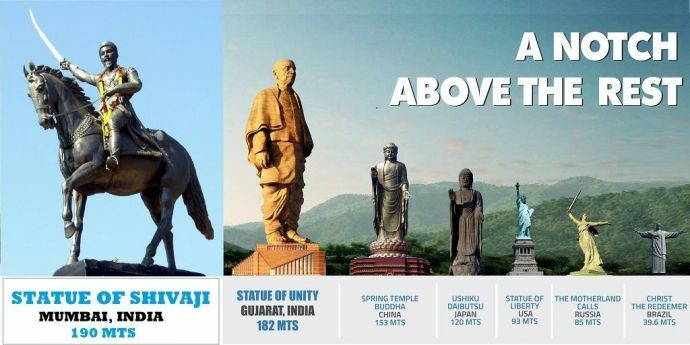 Chief Minister Devendra Fadnavis recently said, “the ‘Shivaji Smarak’ will not only be the country’s tallest memorial, but in the entire world.” Which means that the ‘Smarak’ will surpass the height of New York’s Statue of Liberty and the under-construction Statue of Unity of Saradar Vallabhbhai Patel in Gujarat. Fadnavis had thanked Modi for ‘making it possible’. Other leaders who would accompany PM Modi in the hovercraft to the ‘jalpujan’ and ‘bhoomipujan’ venue off Mumbai coast will include, Governor Ch Vidyasagar Rao, Chief Minister Fadnavis, Shiv Sena chief Uddhav Thackeray, NCP's Satara MP Udayanraje Bhosale and BJP's Rajya Sabha MP from Kolhapur Sambhaji Raje Bhosle. 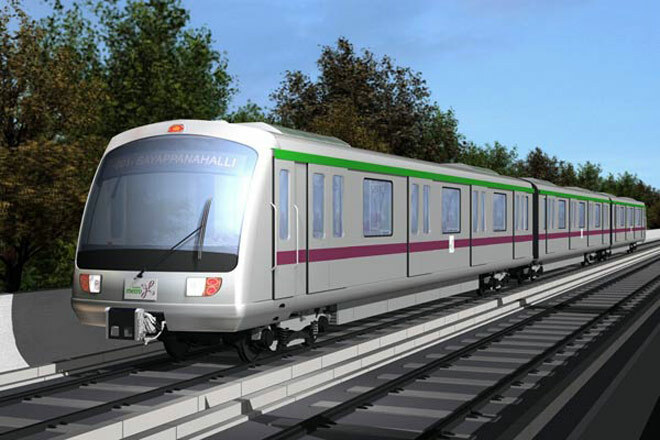 Later, PM Modi will address a public function at the Mumbai Metropolitan Region Development Authority (MMRDA) ground in suburban Bandra, after laying foundation stone for two Metro rail projects, Elevated Rail Corridors Project and Mumbai Trans Harbour Link (MTHL). For the MMRDA event, the government has sent out invitation to over 3,000 guests and dignitaries, including members of the royal family and Shivaji historians. After the main event in Mumbai, PM Modi will leave for Pune, where he will lay the foundation stone of the Pune Metro Rail project at the Agriculture College ground there. NCP leader Sharad Pawar will share the stage with Prime Minister Modi at this event. The government and BJP are trying to make the memorial event a success with hoardings at important places of all districts and also through campaigns in print, TV and social media. However, the memorial project has been facing stiff opposition from fisherfolk and environmentalists, who have alleged that it would affect marine life and ecology of the Arabian Sea. Furthermore, though the Union environment ministry has allowed construction of Shivaji memorial in Arabian Sea, experts claim movement of boats from Nariman Point to the project site will lead to marine pollution and damage the coast.